When modelling a real-world phenomenon, it can often be useful to have multiple descriptions of the phenomenon, each expressed using a different modelling approach or representation. 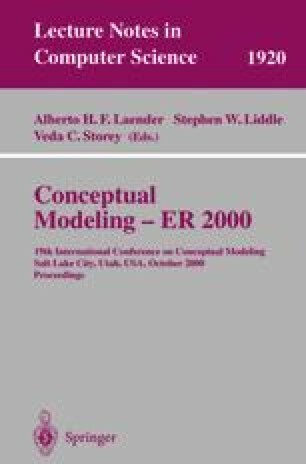 Different representations such as entity-relationship modelling, data ow modelling and use case modelling allow analysts to describe different aspects of real- world phenomena, thus providing a more thorough understanding than if a single representation were used. Researchers working with multiple representations have approached the problem from different directions, resulting in a diverse and potentially confusing set of terminologies. In this paper is described a viewpoint-based framework for discussing the use of multiple modelling representations to describe real-world phenomena. This framework provides a consistent and integrated terminology for researchers working with multiple representations. An abstract notation is also defined for expressing concepts within the framework.